ZuPreem® Natural Premium Bird Food is formulated to meet all the accepted nutrient requirements for the maintenance of various types of adult psittacines (hookbills) and passerines (softbills). The diets are nutritionally balanced and require no supplements. 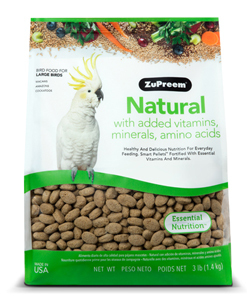 Natural Premium Bird Food contains no colorants and appeal to bird owners who want to feed a more natural diet. Added carrots, celery, beets, watercress and spinach ground from fresh vegetables for a great veggie flavor that increases palatability so even the most finicky birds find these diets irresistible.